Texas Buffalo Shooting Triggers Culture Clash A ranch foreman shot 51 buffaloes that wandered onto his ranch. The owner of the buffaloes says the slaughter is a "terrible injustice," even though the buffaloes were hunted for sport on his own ranch. 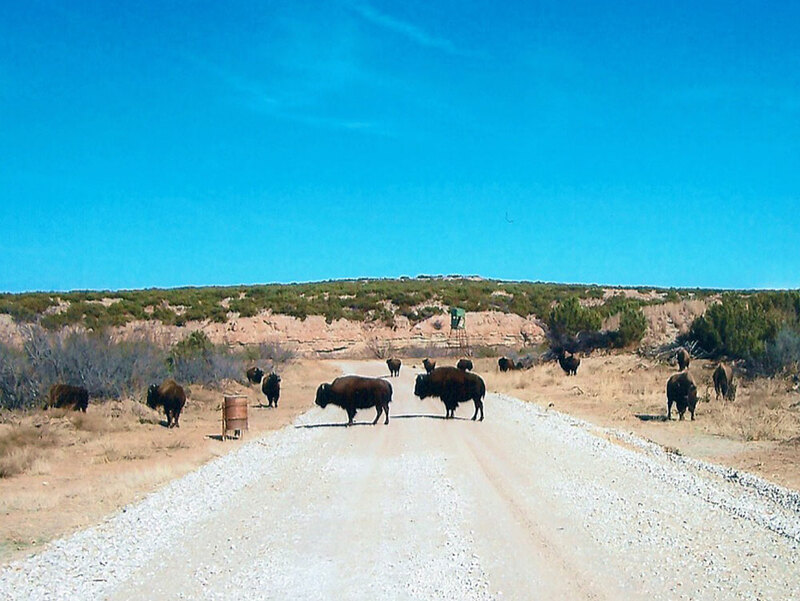 In rural West Texas, the buffalo slaughter is about more than just the wanton waste of meat. It's a clash of two powerful Western cultures. The QB Ranch in West Texas. Owner Wayne Kirk says it is a "terrible injustice" that 51 of his buffaloes were shot when they wandered onto a neighboring ranch. In West Texas, the shooting of 51 buffaloes that had escaped from a hunting ranch is creating a Western-style controversy. The bison had gotten onto a neighboring ranch, and that ranch's foreman shot them over a period of two days. The foreman has been charged with criminal mischief. And even though he has admitted he shot the animals, his conviction is far from certain. The QB Ranch is 20,000 acres of windswept West Texas plains, mesas and canyons owned by a Dallas oilman. After a series of harsh storms earlier this year, ranch foreman Edmund Cassillas went to check on his buffaloes. When he found them, there were quite a few missing. So, he drove the barbed wire fence, and sure enough he found a place where the bison had gone through the wire and wooden posts. "When it rains it washes out the fence," Cassillas says. "We call them water gaps." So Cassillas called Jackie Doyle Hill, the foreman on the Niblo Ranch where the buffaloes had escaped to. It was a short conversation. "He told me there was no more buffalo on the place, and he hung up," Cassillas says. Cassillas was worried, though. This was not the first time the QB buffaloes had gotten out. The next day Cassillas talked to Hill again, and the Niblo foreman said he had taken care of the buffaloes. Hill freely admits he shot the buffaloes — 51 of them. They'd repeatedly strayed onto his employer's ranch, and he'd had enough. The killing attracted a brief flurry of local media coverage. KAMC TV in Lubbock flew a helicopter over the two ranches and shot video of dozens of dead bison, rotting where they'd fallen. But out in rural West Texas, the buffalo slaughter is about more than just the wanton waste of meat. It's a clash of two powerful Western cultures. Since the 1880s, the cold wind blowing through the iron bars in the old jailhouse window in Benjamin, Texas, has sounded a lonely tone. Wyman Meinzer owns the jail. He's turned it into his guesthouse. Meinzer is the official state photographer for Texas and has lived in Benjamin all his life. "I was raised here on a ranch, born in 1950," Meinzer says. "There's an unwritten law, an ethic that you just know." Meinzer says this ethic is about how to be a good citizen to a fellow rancher. He calls it "learning how to neighbor." Three hundred miles northwest of Dallas, this is cattle country writ large. The ranches count their acres in the tens of thousands, and many have been in the same family since the turn of the 20th century. "If you come into this country, and you buy land, you can't really expect the ranchers to assimilate to your ways," Meinzer says. "But these people also are forgiving. They will let something slide once, maybe twice." "Property rights" is a signature idea out here — what you do on your land is your business. Unless, of course, what you're doing on your land doesn't stay on your land. And Meinzer says the QB buffaloes had gotten out, repeatedly. "The bison are roaming," he says. "They have been everywhere. They've been on the highway. They've been on several ranches." There is no debate that bison can be very destructive. Believe it or not, they can jump over a standard barbed wire fence. Or they'll simply land on top of it and crush it. Or they'll put their massive heads down and bull right through it and leave the posts in their wake. Meinzer says everyone here has problems with livestock. If you demonstrate your good intentions, you'll get a laugh, a back slap and a beer for your trouble. But if you seem to be taking the ranchers for fools, they will act, he says. At the Ranch Store Package House, Bonanza plays on the color TV all day. It's no accident that a show like Bonanza plays over and over on the tube. If some think it's a 1960s version of the American West, romanticized, the Cartwright family's straight-arrow devotion to hard work and honorable dealings is a style of living that's still taken seriously out here. Hanaba Welch owns 500 acres with cows. A freelance reporter, she was the first to cover the bison story for the Abilene, Texas, paper. Welch says there is a local distrust of millionaires from Dallas and Plano, rooted in unpleasant past experience. "In this part of the world when you see a big fancy ranch gate, you think well that would be like someone from Plano," she says. Welch says local opinion about shooting the bison runs the gamut from, "They should have picked up the phone and said come get your buffalo," to, "If they'd of kept getting on my property, I'd of shot them too." "Well, I think that different people do feel different ways," Welch says. "I would say the general thought has been shoot one or two. But to shoot 51, that seems excessive." Welch is not thrilled about the bison's being shot, either on or off the owner's ranch. The QB Ranch is primarily a hunting property, and even when they're on the right side of their fence, buffaloes are there to be killed. Hunting buffaloes does not require an excess of sport; they do not flee. At the QB, the privilege of shooting a big bison will cost you around $3,500. So a herd of buffaloes has significant value. But under Texas law, it may have been legal for Hill to shoot the buffaloes once they were off the owner's property. In Texas, buffaloes are classified not as livestock but as indigenous animals. So they enjoy none of the legal protections of livestock. Although Hill has been charged with destruction of property, his lawyer, Regan Wynn, said they will argue he did nothing wrong. Hill has pleaded not guilty to criminal mischief. "The real question in this case is not so much, 'Why did Mr. Hill shoot 51 buffalo?' " Wynn says. "It's, 'Why did a landowner bring 200 head of wild animal onto his property and not fence them in correctly?' 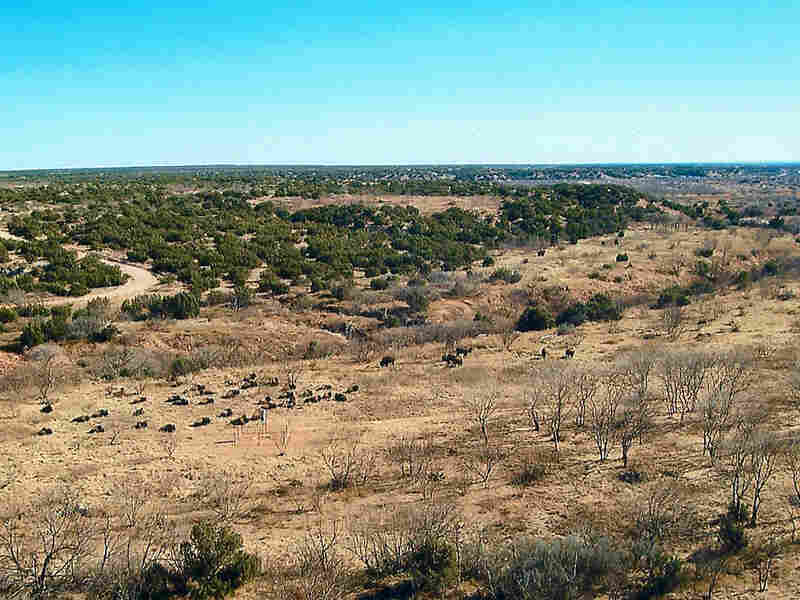 "
The QB Ranch in West Texas is 20,000 acres of windswept West Texas plains, mesas and canyons. Wayne Kirk is the owner of the QB Ranch. 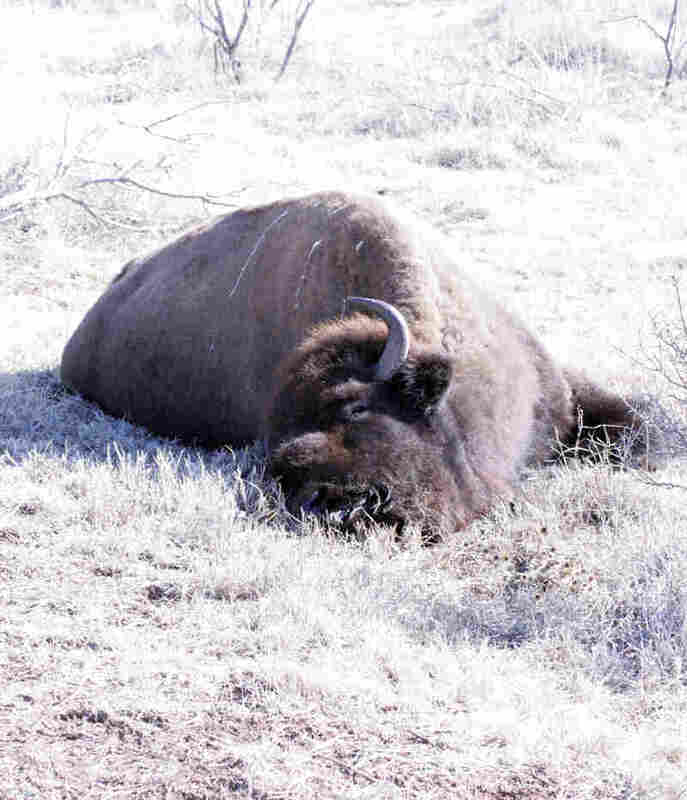 Before the shooting, the buffaloes were roaming over the ranch's entire 20,000 acres. Now they are in a small pen. The proposition that Hill could walk away an innocent man is appalling to Kirk. He makes it clear that he has political allies inside the Texas Republican Party, and he expects to see his case prosecuted. "Slaughtering animals, to me, and I think the state feels the same way — in fact I know the governor's office does — is a terrible injustice," Kirk says. Two hundred years ago, great herds of plains bison — massive majestic animals — roamed the endless prairie of West Texas. What happened to those herds stains the national conscience. The bleaching white bones of the 51 animals rotting in the Texas sun near the QB Ranch are a throwback, a reminder of the carnage a man with a rifle can do.